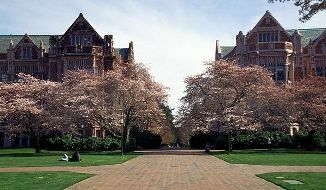 University of Washington was initially founded in 1861 as a private school, it was in 1889 that the school became state-owned by Washington State, as a research university. The school is sometimes referred to as “The U” or “UW.” It is the largest university in the northwestern United States, the oldest public university on the west coast, and a member of the Association of American Universities. In addition to its medical and nursing studies being the one of the best among American universities, other specialized areas of studies are also outstanding. In the U.S. News and World Report, the school was highly placed at No. 25 in the 2009 Best Business School Ranking. Furthermore, according to the 2007 World University Research Paper Quality Rating, published by Taiwan’s Center for Higher Education Assessment, the university was ranked No. 3 globally.